Guest Test of facelifted 2008 Mercedes Benz SLK350 by Jackie Violet. While Boris Johnson and Ken Livingstone battled it out in the London Mayoral elections, another war had erupted in the Home Counties. Porsche, based in Berkshire, challenged the hike in C Tax for high emitters scheduled to start in October 2008. If Ken Livingstone had been re-elected, cars emitting more than 225g/km were set to be charged a daily rate of £25 to enter London, with no exemption for residents. Those under 226g/km would have remained at £8 per day, and those under 121g/km would have been exempt. Boris Johnson has promised to abolish the £25 tax, but we have yet to see what he will actually do once he gets a look at London’s accounts. Happily those following Ken’s footsteps in Manchester have also followed Ken’s out of the door as voters voted with their wheels. The other tax faced by owners of cars over 225g/km is VED. From March 2009, VED on a car emitting 226-255g/km will be £415 a year, and for those emitting over 255g/km, £440 a year. Additionally, from March 2010, these cars will be hit with an additional purchase tax of £750 and £950 respectively. So does this mean the end of expensive cars and the beginning of the electric car boom? One would have thought a resounding ‘yes’, but I have found a powerful and luxurious and stylish sport car that falls under the magic 225g/km. Bring on the drum roll please! For the new generation Mercedes Benz SLK350 roadster that means you will not have to get a second job just to drive in London. The SLK range comprises of the SLK 200 Kompressor, SLK 280 and flagship SLK 350. All three have undergone major surgery with around 650 newly developed components designed to emphasise further the car’s sporty character. This is apparent from the onset with new re-styled front and rear, plus larger exterior mirrors with integrated indicators. The alloy wheels have been revised while the area around the Mercedes star is more prominent. Inside the SLK is a new sporty three-spoke steering wheel with multifunction buttons, plus a stunning instrument cluster with 3-D shaped bezels. However, the most important improvement lies in the heart of the updated SLKs: the engines, which now boast reduced fuel consumption. 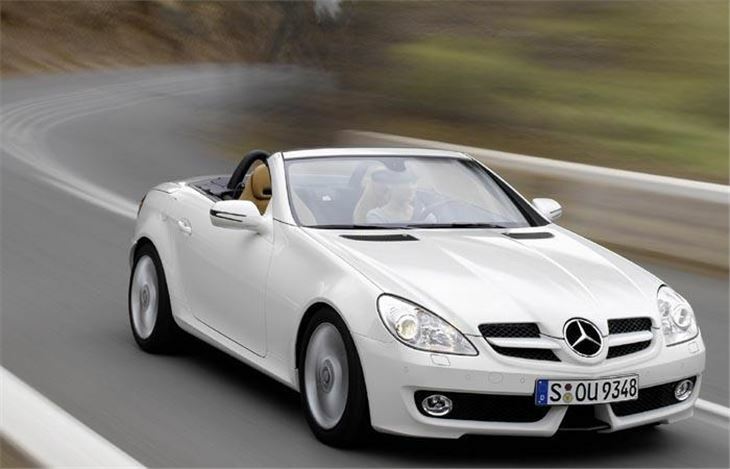 On top of this, the SLK 200 Kompressor and SLK 350 benefits from increased power plus torque. 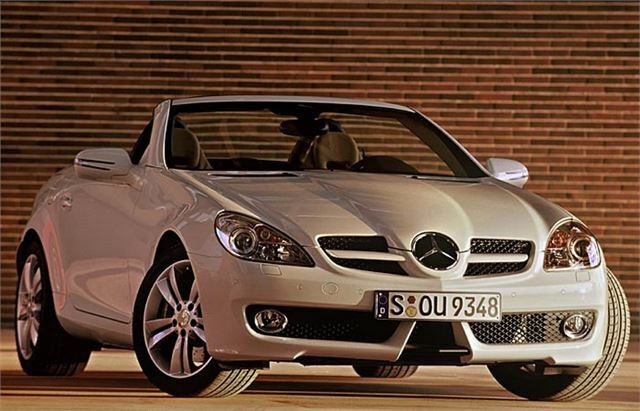 Amazingly, all but one variant, the 6-speed manual SLK 350, produce CO2 emissions of 225g/km or under. I was very fortunate to drive all three models in the stunning English countryside around Daventry. Starting with the SLK 200 Kompressor, I was impressed by the speedy uptake from this 1.8 litre petrol engine that took only 7.3 seconds to reach 60 mph. The automatic was just 0.3 seconds slower. Top speed is a reputed 147 mph (144 mph with the automatic) to which I will take Mercedes word not wishing to blot my clean licence. The fuel economy has been improved from 32.5 to 36.2 mpg on a combined cycle with the automatic slightly more from 32.1 to 34.9 mpg. However, it is the CO2 figures we are really interested in. These have fallen by 25g/km to 184g/km on the manual and a 19 g/km reduction on the automatic to 192g/km. Impressed? Read on. Moving up into the SLK 280 with the 3.0 litre engine and again fuel consumption has been improved by 1.3 mpg on the manual to 30.4 mpg and 0.6 on the automatic at 31.0 mpg. These may seem rather minuscule but it all adds up at the petrol pumps. Equally CO2 emissions are down 11g/km to 220g/km for the manual and 6g/km less on the automatic to 216g/km. The best was yet to come, as now it was the SLK 350’s turn to show me what it could do. I opted for the 7G Tronic 7-Speed automatic transmissions as 93% of UK SLK’s are fitted with this option. With a new V6 engine bursting into life under the bonnet I reached 60 mph in just 5.2 seconds. Oh boy this was good and thankfully for me, top speed is limited to 155 mph. The increased performance is all down to galloping more horse power and tons more torque. In case you are thinking with that performance possibly 5 mpg on a combined cycle? Well think again. How about 30.7 mpg, up 2.7 mpg from its predecessor. The manual does slightly better with a 3 mpg increase. The icing on the SLK 350’s cake is CO2 emissions are for this variant a magical 219g/km. This means we can drive a top of the range high performance car without having to cut back on the weekly shop. Of course, it also means we save lots of money that can be wisely spent on the numerous optional extras. Top on my list would be AIRSCARF that is a very clever neck level heating system, which blows out hot air via the headrests. 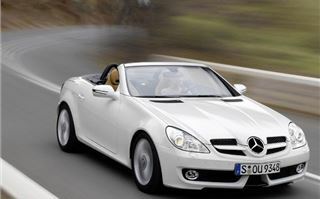 With the SLK 350 taking just 22 seconds to convert from a hardtop to roadster, no ray of sunshine will be missed. Second on my list would be Direct Steer giving exquisite response on the twisting country lanes. Last but by no means least would be the LINGUATRONIC voice control system with either the Audio 50 APS or COMAND packages. Simply speak your destination and the sat nav will obey saving valuable time trying to fathom out how to enter addresses. It will also recognise voice commands for radio stations or names from your phonebook. With looks to give my neighbours lockjaw, superb ride and handling along with lashings of safety equipment, the new updates for 2008, puts the SLK 350 on my dream car list. Even better, I can enjoy the attributes of this ultimate high performance roadster without being penalised in monetary terms from congestion charges. For prices, specs and performance details, please click the tabs.